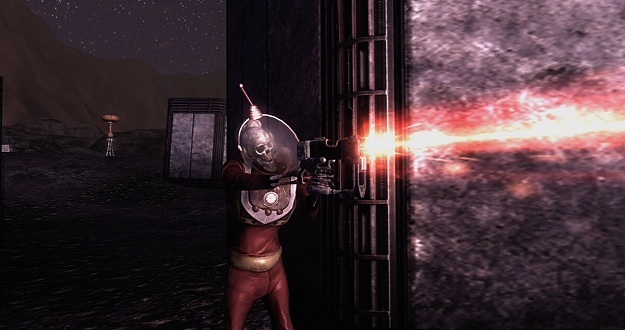 Return to the post-apocalyptic world of Fallout: New Vegas and take on the most fearsome foe yet: Science. But not just any old science, this is science of the “Mad” variety. “Old World Blues” marks the third add-on for the game, and joins “Dead Money” and “Honest Hearts” which are currently available. One more DLC is planned titled “Lonesome Road.” No release date has been given yet, although it is expected later this month or early next. There are also rumors of as many as four additional add-ons in the future, but these are still unconfirmed. In “Old World Blues” the worst of the old world is rediscovered, and the Big Empty turns out to not be so empty after all. When the Courier discovers the Big MT research facility, a pre-war insulation that is now home to the mysterious–and kinda gross–Think Tank, you unwittingly become a subject in a science experiment gone wrong. Things quickly get explodey, and some of the secrets of the Mojave–including the origins of many of the most mutated creatures–are revealed. But not everything is cut and dry, and just because your enemies are brains floating in metal bodies, that doesn’t make them bad guys. All the murderous experiments might, but there is an even greater threat looming, and you must decide whether or not you will side with your kidnappers or turn on them before facing this new, unknown menace. Possibly math. As with the previous expansions, “Old World Blues” will increase the level cap by 5, and introduce new weapons and items. No official price has been announced yet, but it will likely follow the other DLCs and cost 800 MS Points on Xbox Live, or $9.99 on the PSN and Steam when it is released on July 19.